On low speed, mix the water, sugar, yeast, and butter in the bowl of a stand mixer fitted with the dough hook until combined. Let sit for 5 minutes. Add the salt and 4 1/2 cups of the flour and mix on low speed until combined. Increase the speed to medium knead until the dough is smooth and begins to pull away from the side of the bowl, about 3 to 4 minutes. If the dough appears too wet, add additional flour 1 tablespoon at a time, until the dough clears the sides of the bowl. Remove the dough from the bowl, place on a lightly floured surface and knead into a ball with your hands. Spray a bowl with cooking spray (or oil with with vegetable oil), add the dough and turn to coat. Cover the bowl with plastic wrap and place in a warm spot until the dough doubles in size, about 1 hour. Preheat the oven to 425 F. Spray two baking sheets liberally with cooking spray. Remove the dough from the bowl and place on a flat surface. Divide the dough into 8 equal pieces, about 4 1/4 to 4 1/2 ounces each. Roll each piece into a long rope measuring about 22 inches. 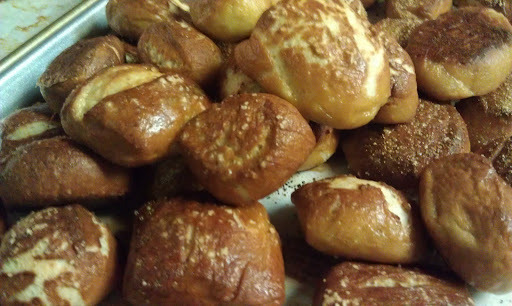 Cut the dough into one inch pieces to make pretzel bites. Boil the pretzel bites in the water solution in batches of about 10-15 for 30 seconds. Remove with a large slotted spoon and place the pretzel bites on the prepared baking sheets, making sure they aren't touching. Brush the tops with the egg wash and season liberally with the salt. Place into the oven and bake for 15 to 18 minutes, or until golden brown.